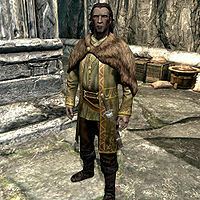 Reburrus Quintilius is a wealthy Imperial citizen living in Markarth. He will become the steward of Markarth if the Stormcloaks take the hold. Reburrus wears a set of fine clothes along with a pair of fine boots. He carries a key to the Treasury House along with a selection of upper-class items and gold. In combat, he relies on a steel dagger. He refers to you as "kinsman" if you are a Nord. He refers to you as "outsider" if you are not a Nord. When first meeting Reburrus, he will greet you very unpleasantly by asking in an irate, annoyed tone, "Why are you bothering me, kinsman/outsider?" If you inquire about where to get a drink, he'll reply, "That's about the only harmless thing you can do in this city. Silver-Blood Inn is the place to go. And once you've had your fill of mead, do us all a favor and go home. Markarth has enough trouble." If you tell him you're looking for work if he has any, he'll answer, "I don't. Go bother Kleppr at the Silver-Blood Inn, he handles the newcomers. And by Ysmir, if you find work, just do what you're told. There's enough trouble in Markarth already." Telling him you want to know more about Markarth will lead to the response, "Then you're talking to the wrong man. You want that elf in the keep. Calcelmo. The only thing I'll tell you about Markarth is stay out of our business. We have enough around here without some outsider causing trouble." If you exit conversation with him, he will dismiss you by saying, "I should get back to work. Money doesn't count itself." or "Time to prepare some more records on the silver trade." Regardless of what dialogue option is selected, he will refuse to speak to you again if you attempt to by reiterating, "Out of my way, kinsman/outsider. ", "Bother someone else." or "Didn't I speak clear enough? Out of my way." If the Stormcloaks gain control of Markarth, but the Imperial Legion regains it, he will relocate to the Palace of the Kings. As with most exiled replacement courtiers, his dialogue doesn't change. This page was last modified on 25 February 2016, at 12:13.